As if the title isn’t long enough… It’s now been 10 years since The Sabbatical Chef was born. I am honestly afraid to read my first attempts at writing, but, well, here it is. My first post. I am a Southern girl and grew up around good food, but my mom and grandmother never used recipes. I learned to make biscuits just by watching them. I couldn’t do it now if my life depended on it, though. Sorry, Mama. My grandmother lived on a farm and cooked on a wood cookstove for most of her life! I remember calling up my mom when I was in college to ask for her recipe for broccoli casserole and she wanted to know why I needed to use a recipe. Guess she figured I was getting above my raising! My fondest memories growing up involved sitting in my grandfather’s kitchen listening to him whistle and sharpen his knives. He tried to teach me about cuts of meat and fresh ingredients, but I was distracted by the smells and sounds he was producing. His beef stew was my favorite. Grandpa Bell had been a chef in a hotel in High Point when he was a young man and he loved to cook. I loved him and I loved to eat so it was a match made in heaven! And whenever a relative would pass away? Not that we weren’t sad, but we kids knew that the food that would be delivered by everyone we knew and a lot of people we didn’t know would be amazing. Especially the desserts. To this day, whenever someone needs cheering up I turn on the oven. I went on to college, moved away from the mountains of North Carolina to what we call the piedmont (central NC), and have been here for 28 years now teaching middle school French in a private school. I have been asked many times where the obsession with France and all things French came from. My family thinks I am odd, to say the least. I am the only one to leave the small town we were born in. French people, of course, totally understand my obsession since they do believe they are the center of the universe and the mecca of all things cultural. And I would have to agree. Upon finding out that my ancestors are Scottish, one Frenchman declared that that explained it perfectly. The Scots have always loved France, he said matter of factly. Voilà! Mystery solved. Now we know why I am weird, although why it happened to me and not my sisters or brother, I am not sure. My high school French teacher should share the blame here! What a saint. I’ll save that story for later. In 2005, I received a summer grant from my school to spend two weeks in Arles, France. 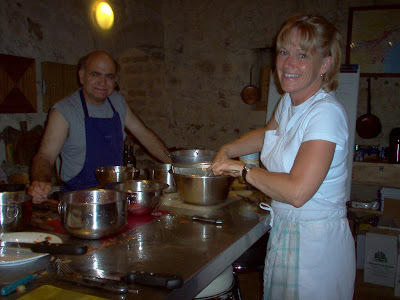 I found out about a cooking school there from Dorette Snover of the C’est si Bon! cooking school in nearby Chapel Hill and decided to take a 5 day Mini-Gourmand course. Vincent Van Gogh spent his most productive period there painting so I figured it would be a good place for me. I had recently separated from my husband and had never taken a vacation alone. So, why not? Pourquoi pas? I spent a week at the Hôtel Le Cloître in Arles, a wonderful family run place in a former cloister. I wandered around the streets of Arles, had picnics in the park, looked at the spots Vincent painted, visited Roman ruins and museums, and read a lot. For the first time in my life, it seemed, I was alone and didn’t need to talk. I was introduced to the music of Yannick Noah as he was in concert one evening right outside my bedroom window! Oh là là! My students know how I feel about him. I moved to the bed and breakfast or chambres d’hôte, run by Madeleine and Érick Vedel. This is where I would stay and take the cooking course. I was a bit nervous because my cooking skills were fairly non-existent. I had spent the past several years making family meals, but certainly nothing French other than an occasional dessert! The week was spent visiting a goat cheese maker, an olive oil producer, an organic winemaker, shopping at the open air market, having lunchtime picnics in incredible spots, and taking an afternoon nap before rejoining the group in the kitchen around 5:30 pm. We all worked together to orchestrate our evening meal. Chef Érick speaks no English so Madeleine would translate for the ones who spoke no French. I went home with a handful of recipes and the determination to cook using herbs and fresh ingredients and to make meals more of an experience rather than just a necessity. Of course, real life set back in, as it always does. I talked about those two weeks non-stop and showed pictures to whomever would look and a friend and colleague at school convinced me to offer a trip back to Arles for adults. We found 3 other brave souls who wanted to join us in the summer of 2006. I had travelled for years with my students but never with adults. I wasn’t sure what to expect.